A report into charity tax concessions that was buried after the Gillard Government lost office has been released under Freedom of Information and includes a call for the extension of Deductible Gift Recipient Status (DGR) to all charities registered with the charity regulator. 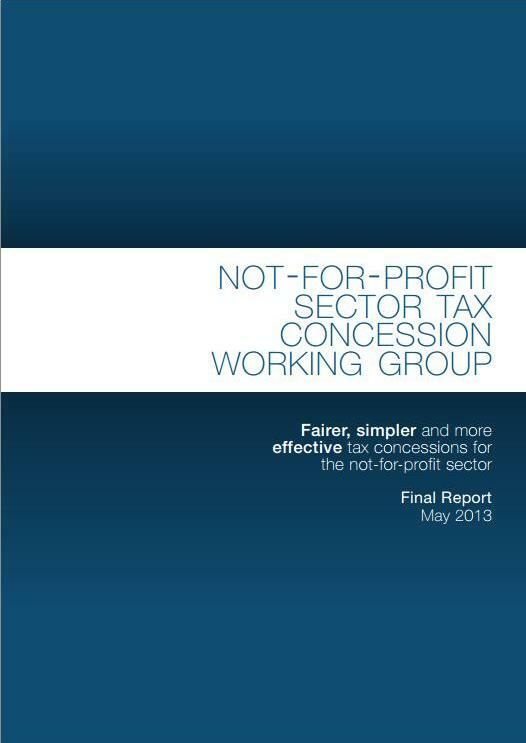 The final report of the Not for Profit Sector Tax Concession Working Group has been released under Freedom of Information with the permission of the Federal Treasury and the expert panel that delivered the report. It was delivered to the former Labor Government in May 2013, but was never made public despite input from hundreds of Australian Not for Profits. Its long awaited findings have been described as an important document for the sector. The NFP Sector Tax Concession Working Group was established under the Gillard Government in February 2012, with terms of reference requiring it to consider ideas for better delivering the support currently provided through tax concessions to the NFP sector. The Working Group was asked to examine the current range of tax concessions provided to the NFP sector in terms of their fairness, simplicity and effectiveness. It was chaired by the then head of the Not-for-Profit Sector Reform Council, Linda Lavarch. The report found that the DGR framework was intended to encourage philanthropy. However, it said the current system for granting DGR status was cumbersome, inequitable and anomalous. Further, it found that the framework was not well placed to handle organisations that carry out a range of purposes that fit within a number of DGR categories. “Reforming the framework would increase certainty, reduce red tape for eligible entities and should further increase philanthropy,” the report found. It recommended that DGR status should be extended to all charities that are registered with the ACNC, but that the use of tax deductible donations should be restricted to purposes and activities that are not solely for the advancement of religion or education. It said the extension should occur in stages, and preferably once the proposed statutory definition of a charity has been legislated. It recommends a separate DGR category for entities that would be charities but for their connection with government (such as public museums and art galleries), as well as a review of entities that are DGRs but fall outside the accepted charitable purposes framework, to determine whether they still merit DGR status. the removal of the minimum $2 gift deduction threshold which it described as outdated. “The Government, in consultation with the NFP sector and employer and employee bodies, should explore development of mechanisms to further promote giving, including simplifying processes for regular workplace giving for employees of organisations of all sizes,” it said. Fringe Benefit Tax also came under the Working Group’s considerations. “The benefit of FBT concessions is not evenly spread among NFP sector employees: only some entities are eligible for the capped FBT exemption while other entities (but not all income tax exempt entities) are eligible for the rebate. Even among eligible entities, salary packaging take-up rates vary,” the report said. The Working Group proposed an alternative support payment to employers, possibly through the tax system, to replace the FBT concessions provided through salary packaging. “A payment to employers would be simpler to administer than a payment to employees, would be more flexible, and would allow eligible NFPs to use it in the manner most appropriate for the organisation, such as in relation to attracting and retaining staff. The payment would be paid automatically to eligible NFPs,” it recommended. “The uncapped access to meal entertainment and entertainment facility leasing benefits has raised concerns about the legitimacy of such concessions, especially since the rest of the community are not able to access such concessions or claim a deduction for such expenses. The benefit of this concession is also not evenly spread among NFP employees, tending to be more highly utilised by eligible employees on higher salaries,” the report said. Peak Not for Profit body, the Community Council for Australia described the report as a very important document, representing a considerable amount of work from a highly knowledgeable working group supported by the Treasury and the ATO, and drawing on expertise from over 225 submissions and some face-to-face consultations. “It is the first time this report has been made publicly available,” CCA CEO David Crosbie said. “One of the most important recommendations it makes is to cap meals allowances and multiple claiming of FBT concessions to underwrite the cost of extending DGR status to all ACNC registered charities. “In practice this would mean all charities (with the initial exception of schools and churches) would be able to offer donors a tax deductible receipt for donations, as well as enabling all charities to receive funds from PuAFs and Trusts and Foundations who are often required to only support DGR eligible organisations. “The current ad hoc and inconsistent application of DGR status makes no sense and discriminates against smaller charities, just as the current FBT provisions offer significant benefits to the well paid, but limited benefits to those on an average salary. “Some employees – mostly in the hospital setting – are not only claiming multiple FBT concessions (they visit a number of hospitals), but also putting in excess of $50,000 per annum on their meals and entertainment cards. This use of tax concessions is difficult to justify. “The recommendations in this report are worthy of serious consideration by governments, our sector and the broader community. “The recommendations it makes are generally not inconsistent with the submission provided by CCA to this working group, but they represent a genuine attempt to achieve a revenue neutral reform of tax concessions provided to charities and Not for Profit organisations. “I think this report provides an ideal starting point for a long overdue discussion in our sector about how tax concessions should or should not be used,” Crosbie said. The working group included University of Melbourne Professor of Law, Ann O’Connell, who said she was pleased that the report had finally been made public. Prof O’Connell has convened a high level meeting for Friday with charity law experts, academics, and representatives from the Department of Social Services, as well as sector leaders to discuss the abolition of the charity regulator, the ACNC, and repealing the Charities Act. “Now we can add the findings of the Working Group report into our discussions,” she said. Donor peak body, Philanthropy Australia has also welcomed the public release of the Working Group report and its contribution to the debate around tax concession arrangements. CEO Louise Walsh said the Working Group makes a number of recommendations which could help grow giving in Australia, and we are keen to examine these further. “It highlights the need for improved ways to promote workplace giving, something that needs to be made simpler and easier, and promoted much more widely. It’s an issue that could be prioritised and explored through the re-established Prime Minister’s Community Business Partnership. “Extending eligibility for Deductible Gift Recipient (DGR) status is a welcome proposal, as widening the criteria for DGR status would help many organisations who currently have limited access to philanthropic support, particularly from Private and Public Ancillary Funds. “Of course it comes at a cost of about $120 million per year, but that should be weighed against the benefits that would flow from having easier access to philanthropic support, and the reduction in red tape that would result from making the DGR endorsement process much more simple and straightforward,” Walsh said. Despite the positive response to the report the Coalition Government is not expected to act on any tax changes within the Not for Profit sector for some time, referring to the Working Group report as “not a government report”. A spokesperson for the Federal Assistant Treasurer, Senator Sinodinos said the Government’s taxation review will take place over the next 18 months. “The community will put forward its views about taxation arrangements applying across the spectrum, including in the Not for Profit sector.We will consult widely and then seek endorsement from the Australian people for our plan at the next election,” the spokesperson said.